Jane's Box of Colours: Blooper has had a make-over! Blooper has had a make-over! Barbara, this is ALL your fault!! I erased the coloured pencil additions around his head and challenged myself to prove you can correct alcohol marker mistakes and end up with a pretty decent finished piece! you want to know how I did it, am I right? Now the shiny Copics phenomena has been causing bit of a stir, why does it happen, is it the ink, is it the paper.... blah, blah, blah! All I can really tell you & show you is Blooper before and after and how I personally dealt with it. Firstly, with the colourless blender I carefully lifted off the E27 and E29 on the lower part of Bloopers cheek that were refusing to blend and sitting on top of the card stock. Do this gently or you will remove more than just the gloopy ink and wipe off the removed ink from the tip of the colourless blender on to some scrap paper. Then as I already knew that I'd saturated my cardstock to the max and therefore could not add any more colour to the base of the cheek I opted to highlight the upper part of the cheek by removing some colour with yep you guessed it the colourless blender! As for that smudgy mess I made on Bloopers dorsal fin! Oh boy, now no amount of Colourless Blender was going to correct that one, so covering it up was order of the day!! I built up various layers of yellow, pink and green to give a pleasing look and hide the printer ink smudges ...........shhhh, no one will ever know they are there tee hee hee!!! .......not about the bleeding that occured, that was easy to solve. I just kept pushing the unwanted areas back with colourless blender, allowing it to dry and repeating the process until all the pink was back where it should be. Nope, my problem was the pink.....yee gads did I just say I had a problem with pink! 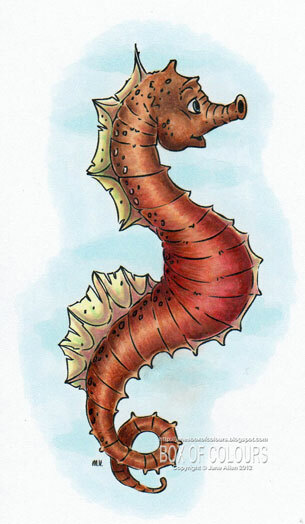 How on earth was I going to incorporate a pink belly with a brown seahorse......what had I been thinking???? My solution was to include browns in the pinks and pinks in the browns to pull the whole picture together and although I still think Bloopers tummy is a tad on the rosy side it has sort of worked. And finally the dreaded BLOB! No, I have not made it disappear via Photoshop Elements....all I used was colourless blender and a lot of patience. As I said in my tutorial paler colours are much easier to remove than dark ones so after about 5 attempts with the blender ny on all the E000 had been removed!! It then allowed me to go over the top with the browns and there is hardly any hint that I had had a dirty great blob of ink there at all! I am the first to admit that sometimes the calamity is such that the bin is where your work is destined but I have hopefully proven that with a little patience, tenacity and the desire to rise to Barbara's challenge that a messy piece of work full of mistakes can be saved!! Your colouring is just Stunning! I think his pink belly looks brilliant. love the whole look. OH BOY YOU DID IT OMG LOL!!!! I so love his new colours and they look so realistic btw! Your the best hun!!! WOW! Wow, what an amazing *fix* - stunning colouring Jane! Well I'd say you passed the challenge with flying colors Jane. LOL I fought all day yesterday with those E25-29 colors and that shiny gloppy mess and finally threw in the towel. You have more patience than I do. :-) Thanks for showing us what CAN be done. hugs! Jane you are a 'genius'! I wish I could do half of that! Now I'M the one cursing...what a gorgeous little seahorse! And to think he started out as something you wanted to discard! Thanks for all the tips. Those of us just starting out with Copics can sure use the advice! Goodness Jane what a stunning image , your shading with copics is fabulous. wow, I have been a follower of yours for a while now and your work gets better and better. I love visiting and seeing what you are up to. Note to myself... must try harder with the blender! Hello my friend, was thinking of you and thought I stop by. Well, I was so in love with Blooper the seahorse that I had to leave a message. Oh I love what you did with Blooper he now is handsome! Thanks for sharing his new image. Great blooper fixers post. I recently learned that the tips of the copic nibs can get a bit clogged and need to be cleaned. I was having a lot of issues of clumping & shininess but after I cleaned the nibs with a cotton ball with alcohol on it I no longer had that issue! It was recommended to me to clean the tips of the nibs regularly. I hope this tip helps you and other with the same problem.